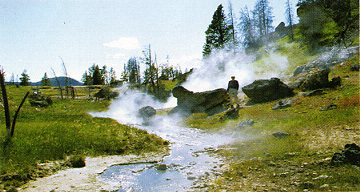 One of the first boiling springs in which bacteria were discovered was Boulder Spring, a large spring near Fairy Creek in the Lower Geyser Basin. 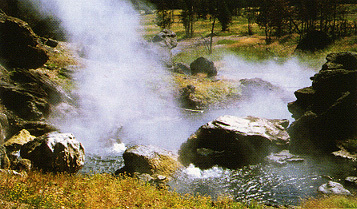 In this beautiful alkaline spring, small amounts of hydrogen sulfide provide a source of energy for bacterial life. The bacteria live attached to the siliceous walls of the spring basin, where they are difficult to see, but they can be made visible by a simple trick. 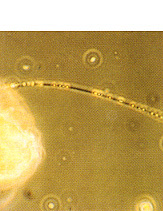 If microscope slides are immersed in the boiling water, they serve as surfaces for bacterial colonization. After several days immersion, such slides are loaded with freshly grown bacteria, which can be easily seen under the microscope. Researchers set up their microscope in a car near the Firehole River bridge at Ojo Caliente, and were able to study the Boulder Spring bacteria quite easily.